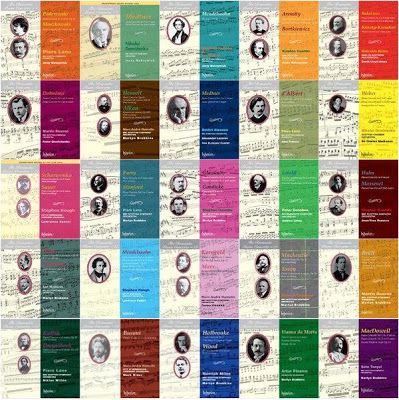 The Romantic Piano Concerto Series, Hyperion Records, now at 64 volumes. See listing here. I love piano concertos, especially written in the “romantic period style”, and unless I want to hear a specific favorite by the big name composers, this is my go-to set of CDs (yes, all of these can also be downloaded in several MP3 formats including lossless). covers of first 50 CDs. “The concept of The Romantic Piano Concerto series was born at a lunch meeting between Hyperion and the BBC Scottish Symphony Orchestra sometime in 1990. A few months later tentative plans had been made for three recordings, and the first volume, of concertos by Moszkowski and Paderewski, was recorded in June 1991. 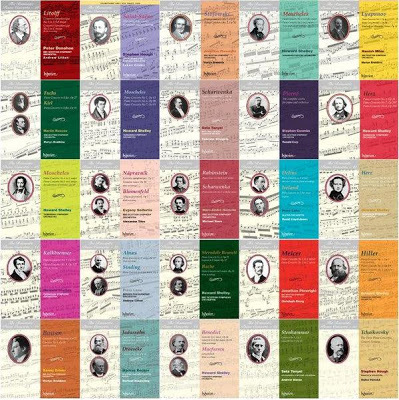 The first fifty volumes include 131 works for piano and orchestra, 102 of which are titled ‘Concerto’, the remainder being generally shorter single-movement works or sets of variations. Fifty-nine of these works are premiere recordings and many other featured works have only been recorded once before, often in clearly inferior versions and frequently cut. The sound quality of these recordings is very good, the selection includes many composers and works most listeners will not yet know but it’s all really good. Highly recommended. I’m listening to volume 57 [Wiklund, Piano Concerto No 1, Op 10 and other works] as I type this. This entry was posted in Classical Music and tagged Hyperion Records. Bookmark the permalink. Wonderful! I have a few of these, but didn’t have any idea there were so many. This could cost me some serious money. Trent, beautiful romantic period piano concsrtos are always a good thing. This is a well done series, featuring many composers I’d never encountered before. AMAZON lists 64 CDs (so far) in this series. I’ll have to sample a few. George, that’s right, 64 so far, with more on the way. Hyperion hasn’t set a limit on the number of discs they will record. Charles, I find piano concertos to be some of my very favorite classical music.